In celebration of the Hollywood Theatre’s Feminist March programming, the bimonthly series Queer Horror adds a special off-month screening to its calendar with 1975’s THE STEPFORD WIVES! Sponsored by Finger Bang nail salon and Double Mountain Brewery, this rare 35mm presentation is hosted by Portland’s premier drag clown Carla Rossi with a preshow starring Portland’s own 1950s drag housewife, Madame DuMoore! Adapted from Ira Levin’s classic thriller, THE STEPFORD WIVES follows photographer Joanna Eberhart (Katharine Ross) as she moves with her husband and children to a quiet suburban community in Connecticut. But something strange is happening in the town of Stepford, where the local women have replaced their careers and ambitions with cooking and cleaning – at least ever since the town’s defunct women’s group was visited by Betty Friedan – and Joanna and fellow newcomer Bobbie (Paula Prentiss) find themselves in a race against time to learn what lurks behind the walls of the Stepford Men’s Association. Derided upon its release for being both too “anti-men” and “a rip-off of the women’s movement,” this incisive and ahead-of-its-time satire is more relevant, hilarious, and terrifying than ever before. The Hollywood Theatre’s bimonthly series QUEER HORROR closes out a year of slasher films with the classic CANDYMAN! Sponsored by Royale Brewing Co and Finger Bang nail salon, this 35mm screening summons Candyman herself in a pre-show starring the House of Shade’s Flawless Shade and Kimber Shade, all hosted by Portland’s premier drag clown Carla Rossi! From the work of James Whale and John Waters to Patricia Highsmith and Clive Barker, horror has deeply impacted queer culture and sensibilities and QUEER HORROR asks why. QUEER HORROR is programmed and hosted by Portland’s premier drag clown Carla Rossi and her human avatar Anthony Hudson, with artwork by resident artist Jason Edward Davis. The Hollywood Theatre’s bimonthly series QUEER HORROR celebrates the season – and QUEER HORROR’s limited edition BRIDE OF CARLASTEIN porter release with Royale Brewing Co – with HALLOWEEN H20! 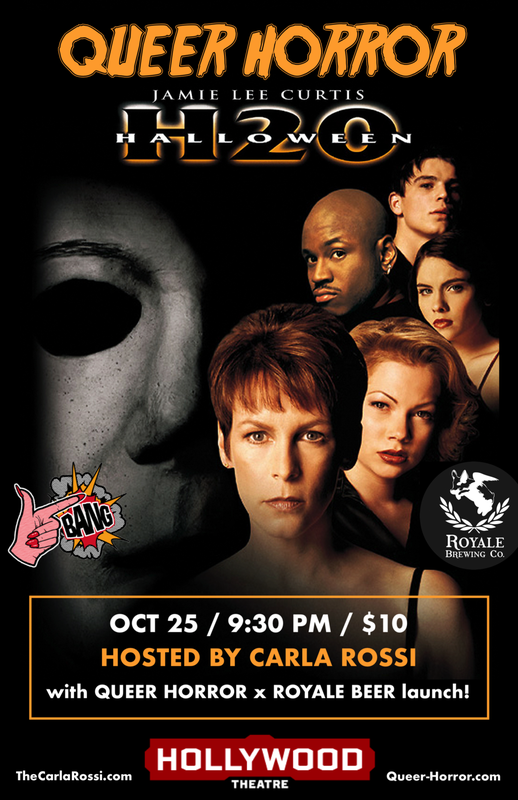 Sponsored by Royale Brewing Co and Finger Bang, this 20th anniversary screening opens with a preshow tribute to the night HE came home twenty years later (twenty years ago) hosted by Portland’s premier drag clown Carla Rossi! Directed by Steve Miner from a treatment by producer and out queer screenwriter Kevin Williamson (SCREAM), 1998’s HALLOWEEN H20 finds Laurie Strode (Jamie Lee Curtis) living under an assumed identity as a private school headmistress in Northern California, two decades after she became the sole survivor of her brother’s bloody rampage in Haddonfield. When Michael returns to finish what began on Halloween night in 1978, Laurie must rediscover her inner survivor to save not just her own life but those of her only son (Josh Hartnett) and his girlfriend (Michelle Williams). Also starring LL Cool J and Joseph Gordon Levitt, HALLOWEEN H20 is the original sequel to ignore the rest of the franchise and pit Laurie Strode in a relentless fight to the death with Michael Myers – and in the process creating a feminist warrior more fierce than death itself. Meet CARLA ROSSI and JASON EDWARD DAVIS at the QUEER HORROR booth at DragCon! Meet ANTHONY HUDSON / CARLA ROSSI and JASON EDWARD DAVIS at the QUEER HORROR booth at CRYPTICON! We're back for our third year you'll see a lot more from QUEER HORROR in panels and even more to come! The Hollywood Theatre’s bimonthly program QUEER HORROR meets again on a rare Friday the 13th for nothing other than FRIDAY THE 13TH PART VII: THE NEW BLOOD! Now sponsored by Royale Brewing Co, this 30th anniversary 35mm screening opens with a preshow tribute to Camp Crystal Lake and the Haus of Voorhees hosted by Portland’s premier drag clown Carla Rossi and starring Seattle's SPARKLE LEIGH and PDX boylesque star JAXIN YOFF! Meet QUEER HORROR's Anthony Hudson / Carla Rossi and Jason Edward Davis at our first ever Oregon Ghost Conference! Come join us in our 7th year of bringing Paranormal Enthusiast together. Last year we offered 30 classes, 17 Speakers, 5 Panels along with Tours, Investigations, Gallery Readings and so much more. Come see what we have planned for you in 2018. 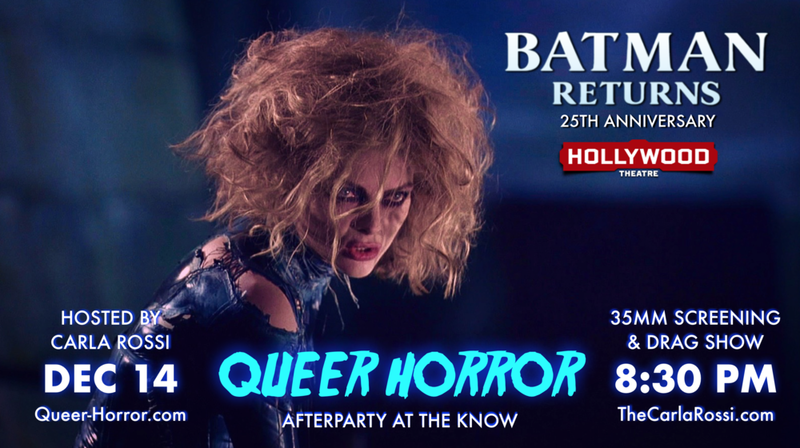 The Hollywood Theatre’s bimonthly program QUEER HORROR celebrates a year of women-centric programming with a 25th anniversary screening BATMAN RETURNS! Hosted by Portland’s premier drag clown Carla Rossi, this 35mm holiday spectacle opens with a huge drag and burlesque preshow tribute to Catwoman in all her incarnations. The Hollywood Theatre’s bimonthly program QUEER HORROR reanimates its annual short film festival with a Halloween scream! Celebrating one year of women-centric programming, QUEER HORROR HALLOWEEN showcases short films by local and national filmmakers specifically commissioned by hostess-with-the-grossest Carla Rossi with one guideline: make it Satanic and make it feminist. For that extra skip in our swamp witch step, each film is followed by a live death metal burlesque performance by the women of SIGN OF THE BEAST BURLESQUE! Followed immediately by an after-party and costume contest at The Know, QUEER HORROR HALLOWEEN is the reason for the season and a hallowed black mass for women who rise up, rage, and reject! The Hollywood Theatre's bimonthly program QUEER HORROR creeps closer to immortality with Death Becomes Her! Hosted by Portland’s premier drag clown Carla Rossi, this 35mm screening continues a year of women-centric programming and opens with a diva duel between Carla and Portland’s own grand dame of dance & drag, Kaj-anne Pepper! The Hollywood Theatre’s bimonthly program QUEER HORROR kicks off Pride season with a 35mm screening of DROP DEAD GORGEOUS! Continuing a year of women-centric programming, this Pride special opens with a spectacular drag pageant featuring Portland’s fiercest queens, all hosted by Portland’s premier drag clown Carla Rossi! The Hollywood Theatre's bimonthly program QUEER HORROR continues its year of women-centric programming with SLUMBER PARTY MASSACRE! Hosted by Portland’s premier drag clown Carla Rossi, this April edition opens with a pre-show twist on the ‘80s slasher classic! The Hollywood Theatre’s bimonthly program QUEER HORROR fires off Cupid’s arrows with BOUND! Hosted by Portland’s premier drag clown Carla Rossi, this Valentine’s Day special rings in a full year of women-centric programming for QUEER HORROR with an opening preshow featuring Honey LaFleur, Leigh Rich, and even more Valentine's treats! The Hollywood Theatre’s bimonthly program QUEER HORROR resuscitates its annual short film showcase with QUEER HORROR FOR THE HOLIDAYS! This holiday special is programmed through an open call for entries from filmmakers of all calibers. Portland’s premier drag clown Carla Rossi wants YOU to grab your cameras, GoPros, phones, shadow puppets, and let your R-rated nightmares loose for a night of festering frights, whether holiday-themed or just plain spooky and secular! Fleshed out with shorts by established filmmakers and performances from the grittiest ghouls in PDX, QUEER HORROR FOR THE HOLIDAYS is on the hunt for fresh blood! The Hollywood Theatre's bimonthly program QUEER HORROR breaks from its regular schedule for this special seasonal screening of 1993’s ADDAMS FAMILY VALUES in 35mm! Hosted by Portland’s premier drag clown Carla Rossi, this Thanksgiving edition opens with a flaming Camp Chippewa pre-show starring Portland’s favorite turkey-basted queens! Directed by Barry Sonnenfield, Adams Family Values picks up as a mustachioed baby Addams is born, Wednesday and Pugsley head off to summer camp, and Uncle Fester falls for a black widow killer looking for love and a Ballerina Barbie. Written by out screenwriter Paul Rudnick with music by Marc Shaiman (Hairspray) and starring queer icons Anjelica Huston, Christina Ricci, Carol Kane, Christine Baranski, Dana Ivey, and the incomparable Joan Cusack as Debbie, ADDAMS FAMILY VALUES turns the family film on its (severed) head like only the Addams clan can. After six years on Alberta Main Street and now under new local ownership, Screaming Sky Gallery is conjuring a ghoulish grand reopening party on Halloween night! To top off our witches’ brew we’re summoning Portland’s premier drag clown CARLA ROSSI to curate this night of a thousand frights! Jumping off her successful QUEER HORROR series at The Hollywood Theatre, Carla is launching her new QUEER HORROR brand of shirts, pins, and prints for this special one-night pop-up event from 7 to 9 PM on Monday, October 31st. A collaboration between Carla’s human avatar Anthony Hudson and artist Jason Edward Davis, QUEER HORROR is a lifestyle brand catering to ghouls of all genders and orientations. Mark your calendars, ready your costumes, rev up your brooms, and we’ll see you on Halloween night – it’ll be a SCREAM!